The event in North Atlanta included a celebrity flag football game with 21 Savage, Lil Yachty, Offset and Takeoff. H U N C H O D A Y Successful!!! Super Fun!!! Thanks To Everybody Came Out I Really Appreciate It!!! Thanks To All The Participants Really Means A lot Can’t Do Names Cuz I Dnt Want To Leave Off Anybody!! So Thanks to Everyone!!!! 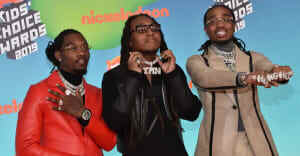 Tha N A W F.
Quavo hosted a celebrity flag football game on Easter Sunday at his high school, Berkmar High School, as well as an Easter egg hunt and training camp. His flag football game featured a full line up of super stars. 2 Chainz coached Quavo's team, Team Huncho, and Julio Jones coached Team Julio. 21 Savage, Lil Yachty, Offset, Takeoff, Von Miller, YFN Lucci and more showed up for the event. In the social media posts above and below, you can check out posts from the big event, including Quavo completing a successful pass and Lil Yachty dancing. Huncho Day w/ @lilyachty @offsetyrn . #ssc #xv #hunchoday #migos . .